Climbing photography combines two notoriously equipment-fueled pursuits and forms a dangerous coupling for the gear freak within. So when you’re carrying your toolkit on your back you want to know that everything you pack delivers genuine utility. With so much equipment out there this can be a process of trial and error, but there is something deeply satisfying in finding a piece of kit that works well. Form-for-function has a beauty all its own. Here then are my current top five pieces of essential equipment for climbing photography, no matter how big the walk in. It takes me a little while to relax sitting on an ab rope for long periods of time. Rope protectors ease my mind and help me concentrate on the climber instead of worrying about my safety. They’re light, rugged, quick to use, prolong the life of your ropes and just can’t be beaten for making you feel safe on abseils. They’re the best things since sliced bread, and just like the loaf you can easily make your own. The rope bucket is simply a small haul bag containing an abseil line, suspended from the harness of an abseiling climber. (It generally has more structure to it than a rope bag). The bucket feeds rope out cleanly and smoothly, preventing the snags and tangles associated with throwing a rope down a face. When you’re in position to shoot there is no line to pull up out of the viewfinder which saves you time. One point to beware. Jugging back up the doesn’t work as smoothly as on hanging rope. There is no weight of rope below you keeping the line tight so as you move up you have to help feed the rope through your kroll/gri-gri. Sixty metres of static line compacts very nicely into a bucket and is far less bulky than coiling. It’s a beautifully simple idea that just works. The Rock+Run bucket is reviewed at UKC with some ideas for customization. These devices are essentially hard disks with built-in sockets accepting the different formats of memory card and allow you to copy your digital images to provide an on the spot backup. They are compact and robust. Some have color screens and support more advanced interaction like previewing, slideshows and editing, but generally you’ll want to see the images hi-res and on colour-calibrated monitors before you start pruning. If you are paranoid about data loss and card failure these devices make it easy to take backups in the field. Importantly it allows you to recycle memory cards on a longer trip without the hassle of finding a computer and a DVD burner. I use them simply as mass storage for backups on road trips with no need for image viewing/editing. I carry two with me to provide redundancy and guard against failure. I always feel uneasy formatting memory cards with only 1 copy saved. Look out for a ‘verify’ download mode so you can be certain you have accurate copies without corruption before you reformat your cards. Performance and battery life are likely to be an issue. My Jobo Giga One’s are a few years old and while they copied my 1GB cards just fine they take an age to download 4GB of data. Both Jobo and Digital Foci have interesting offerings. Professional lenses are heavy. Tripods are cumbersome. So when you’re shooting from the ground and moving around to stay on top of the action then nothing beats the monopod. It’s a perfect crag companion for taking the weight off. It’s a walking pole. It’s a weed whacker. A good ball-head wins out over clumsy handles and levers every time for me, and makes for easy portrait to landscape transitions. Of course nothing beats a tripod, cable release and raised mirror for total steadiness, but for me the monopod wins out on cost/benefit most of the time. Get the right height, lean in it to it and start harvesting images! The off-camera flash is still an experimental candidate for my kit list. While an on-board flash is useful for fill-flash now and then, a more powerful off-camera unit, or two, open the door to more creative control. 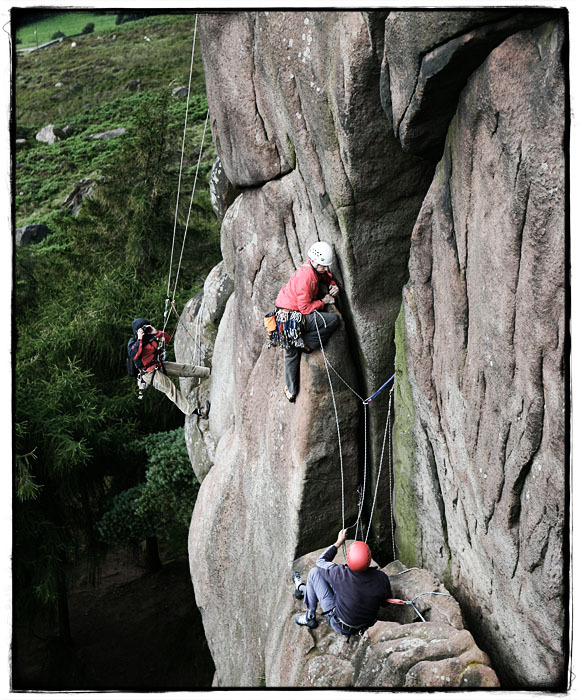 A small number of climbing photographers have become known for their use of lighting.